You're ready for a new (or used) ride, and all you need is some financing. No problem. Our car loan service helps Quebec drivers secure a loan and get on the road. Applying is quick, simple, and convenient. Get a loan even with bad credit or no credit. Loans start at $5,000 and go as high as $40,000. Don't pay a cent to apply or get approved. I don't live in a big city like Montreal. Can I still get a car loan? Yes. Our network of lenders and dealers operates across all of Quebec. So while we can match you with a car loan partner in Montreal, we can also match you if you live in a smaller place, like Sherbrooke, Rimouski, or Drummondville. How much tax do I have to pay on a vehicle purchased in Quebec? Unlike in some other provinces, Quebec still has two separate taxes, GST and QST (Quebec Sales Tax), and they're calculated differently. If you purchase a car from a registered dealer you'll have to pay 5% GST on the price and 9.975% QST on either the price of the car or the estimated value of the car — whichever amount is higher. If I buy a used car, can I still benefit from the manufacturer's warranty? Of course — as long as the warranty hasn't expired. When vehicle ownership changes hands in Quebec, so does the warranty. The calculations are based on a couple factors, including your loan amount, interest rate, and loan term. Naturally, a large loan and high interest rate will lead to more expensive payments, and the opposite is true for smaller loans and lower rates. But it's the loan term that can really decide your monthly payments. The longer you stretch out your loan, the less you pay month to month — but be careful. You have to pay more interest on a long loan than on a short loan. 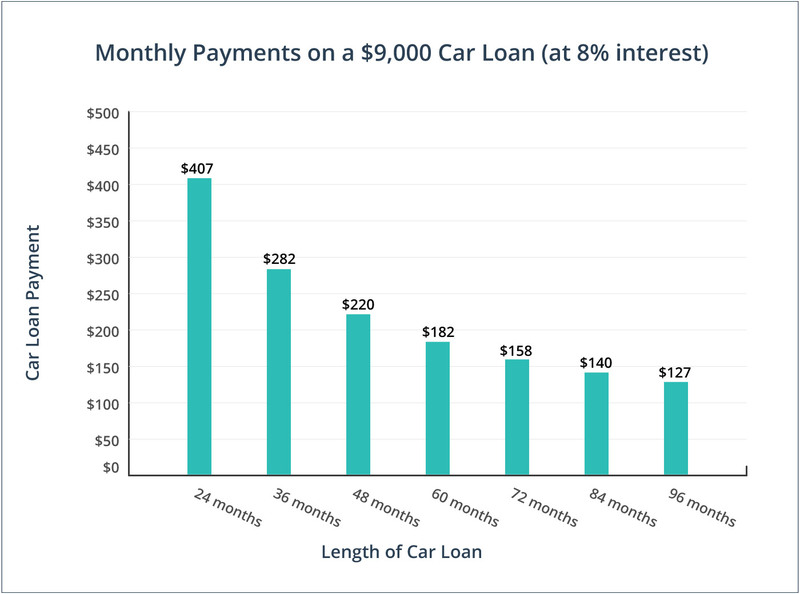 Take a look at our graph to see what your payments might look like for a $9,000 loan at 8% interest over different periods of time. Licensed Quebec car dealers have to follow provincial regulations designed to protect consumers like yourself, so it's safer, financially, to work with them. Use the Office of Consumer Protection's tool to learn more about the licensed dealer we match you with. Want to verify the info (number of kilometres, previous repairs, etc.) listed in the car's label before you buy? Request a history of the car from the SAAQ (la Société de l'assurance automobile du Québec) and get access to an official record of the vehicle. Short loans, like 24, 36, and 48-month loans, are smart options if you can afford bigger payments. You'll pay down your principal faster and save on interest charges. Drive the car for at least 30 minutes and get a feel for how it steers, brakes, and accelerates. Remember to also test it on different road conditions and at different speeds. Read reviews and study the car's safety ratings. And don't just learn more about the car — learn more about the process of buying a car too. Visit the SAAQ website for more car buying tips and resources. I can't get a car loan in Quebec if I have bad credit or no credit history at all. False. We actually specialize in car loans for Canadians with poor credit or no credit history. So even if you've experienced a repossession, declared bankruptcy, or recently moved to Canada, the lenders and dealers in our network will work with you to get the financing you need. I have 10 days to return my car and get a full refund. False. There's no return policy for car sales in Quebec. Make sure you're certain about a vehicle before you buy it because there's no turning back once you sign that contract. The Consumer Protection Act applies to all used car sales in Quebec. False. The Consumer Protection Act only protects you if you buy a car from a dealership. When you buy privately from an individual, like from a friend or an online seller, the Office of Consumer Protection can only act as an advisor for the sale. It's difficult to get a car loan for a used car in Quebec. False. Our car loan service matches you with lenders and dealers who offer auto loans for used vehicles. The car-buying season isn't in full swing yet, but Quebec's already clocked in 39,800 auto sales between January and March 2016. When it comes to buying a new car in Quebec, North American vehicles reign supreme. Recent numbers from Stats Canada show that Quebec residents bought 137,911 North-American-made cars and 80,545 imports in 2015. While Western provinces like Alberta and Saskatchewan reported a spike in auto loan delinquencies in Q4 2015, Quebec actually boasted the lowest delinquency rate (0.92%) in all of Canada. Truck sales are up. According to Scotiabank's Global Auto Report, truck sales in Quebec rose almost 25% compared to 2015.